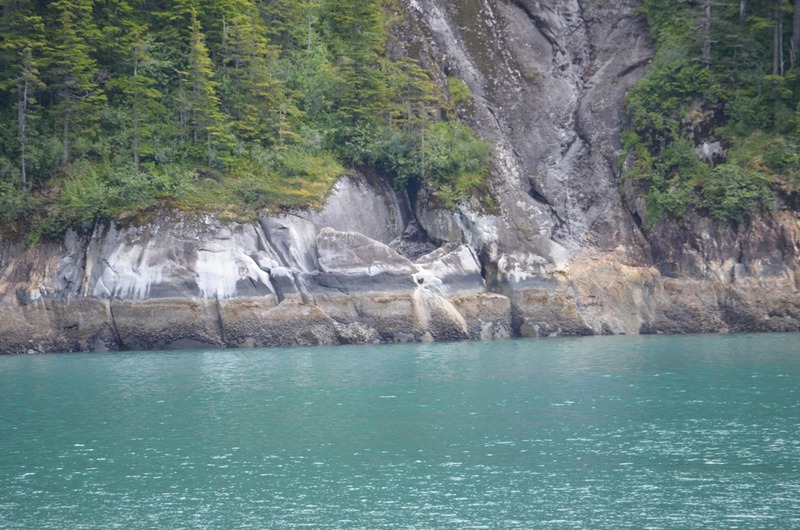 Thursday was “nature day,” the day we sailed Tracy Arm Fjord. 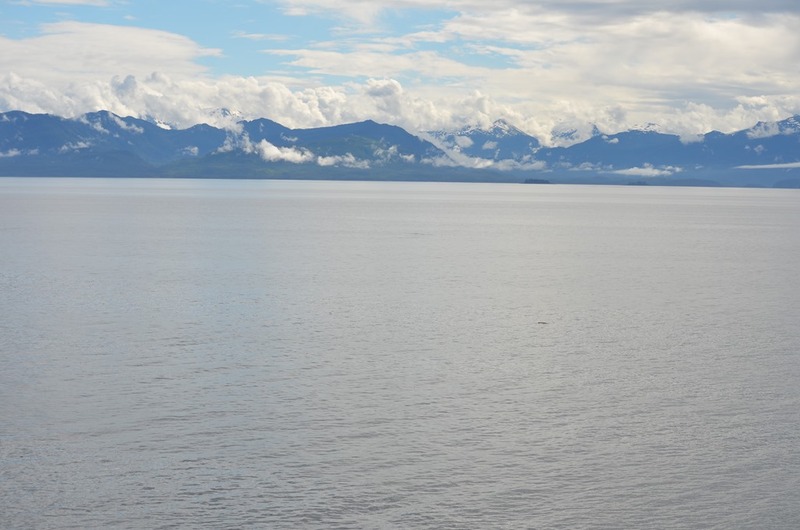 It was named after the Secretary of the Navy Benjamin Franklin Tracy and lies south of Juneau. Twin glaciers called the Sawyer Glaciers are located at the end of it, but the ship can’t always get up close to them (depending on the ice conditions). 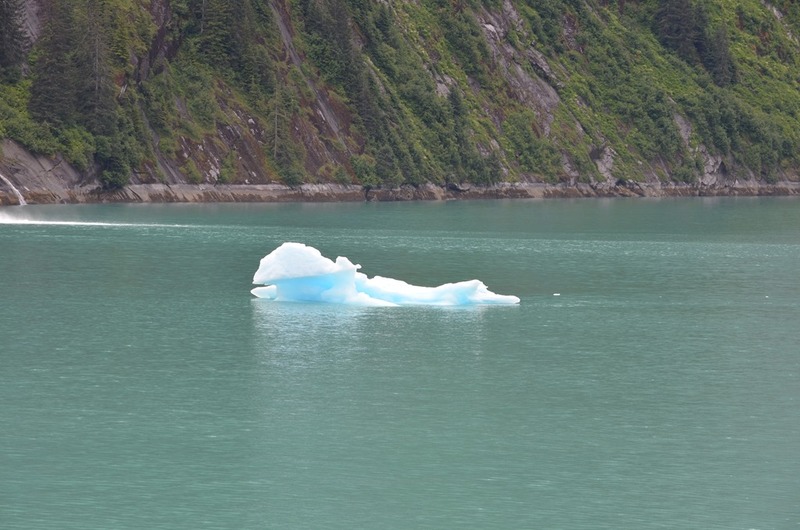 I was interested to see it, since on the May cruise we had sailed Glacier Bay instead. 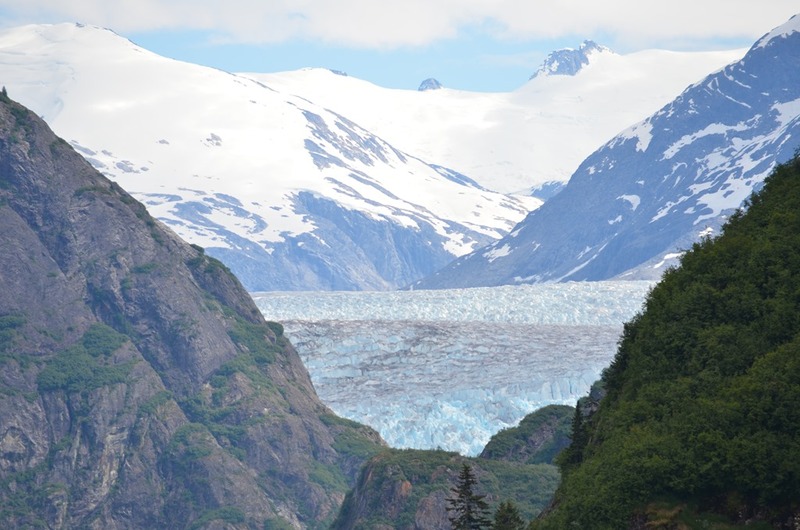 I’d heard many people compare the two, and I’d even been told that I would be disappointed in Tracy Arm after having been to G lacier Bay. Well, I wasn’t disappointed at all. 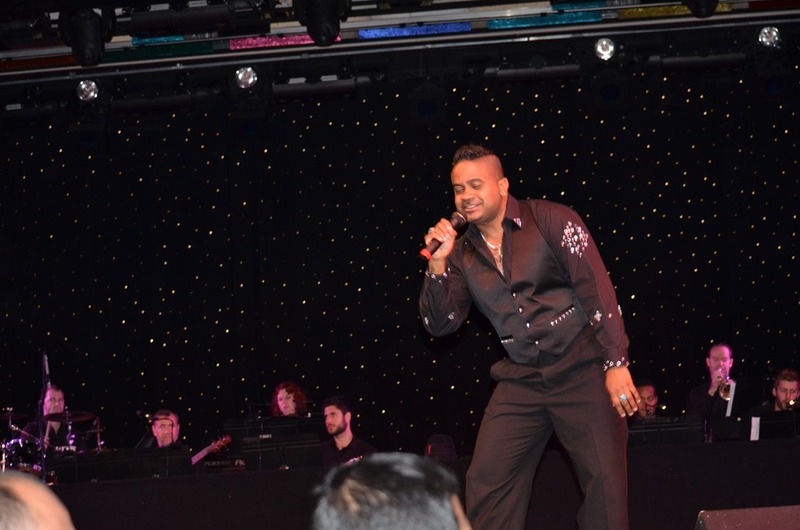 The two experiences were different, for sure, but it would be hard for me to say I liked one more than the other. 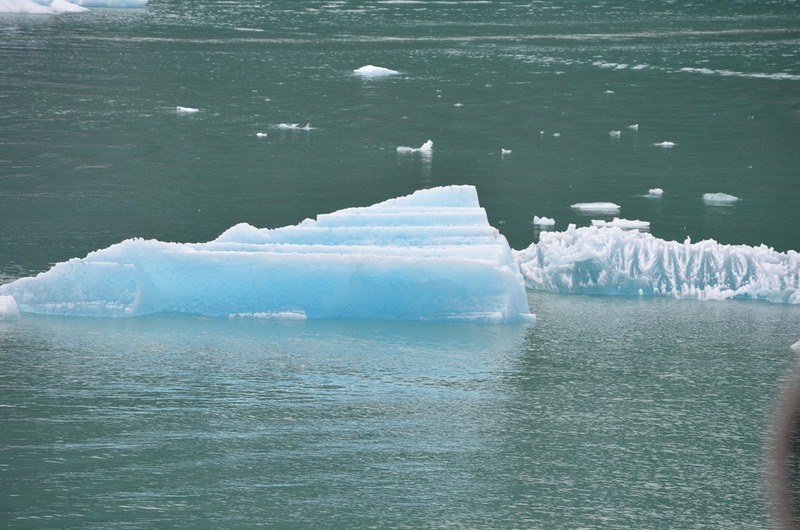 Glacier Bay provided a more up-close-and-personal look at the Glaciers, and they were awesome – but in the end, it’s just ice. GB was like some uninhabited planet from a Star Trek world, where only alien life forms could survive for long. Tracy Arm was very much alive. 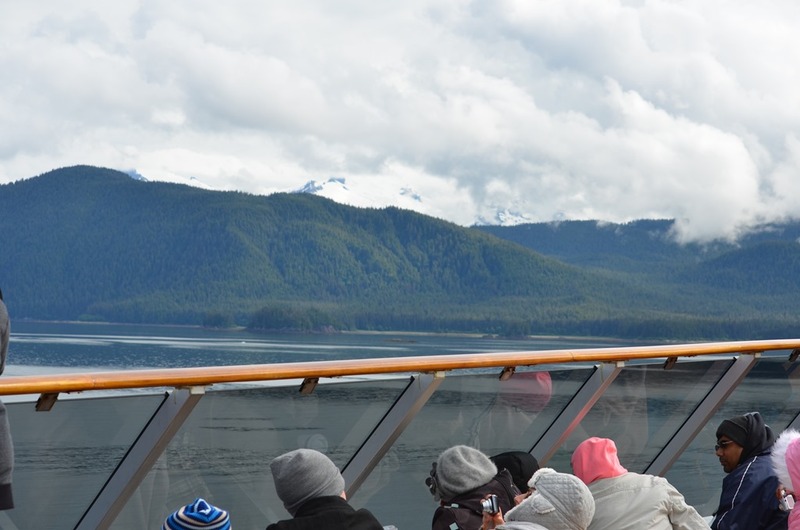 The wildlife was everywhere; maybe it’s only because it was later in the season, but we saw far more whales, eagles, otters, even a bear. 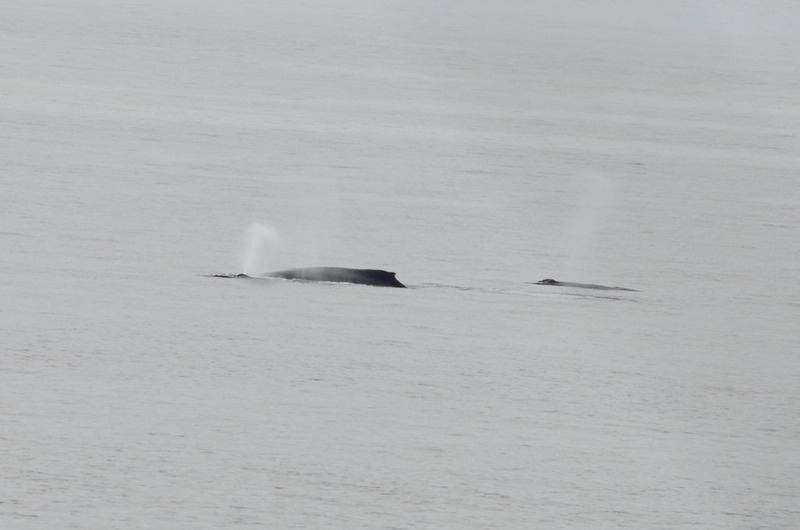 As we came back through the buffet after having some breakfast, we saw a big group gathered at one of the windows where there were several whales blowing and playing and diving. We saw a mo m and baby that entertained us all for a long while. 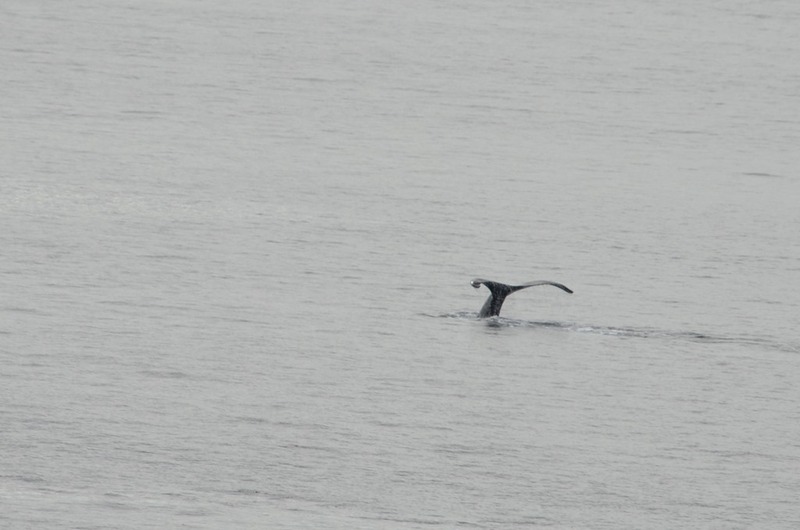 Since the whales were on the starboard side of the ship (again – they seemed to prefer that side in May, too), as was our cabin, we went back to watch them from our balcony. It was a great, relaxing way to spend a lazy afternoon. 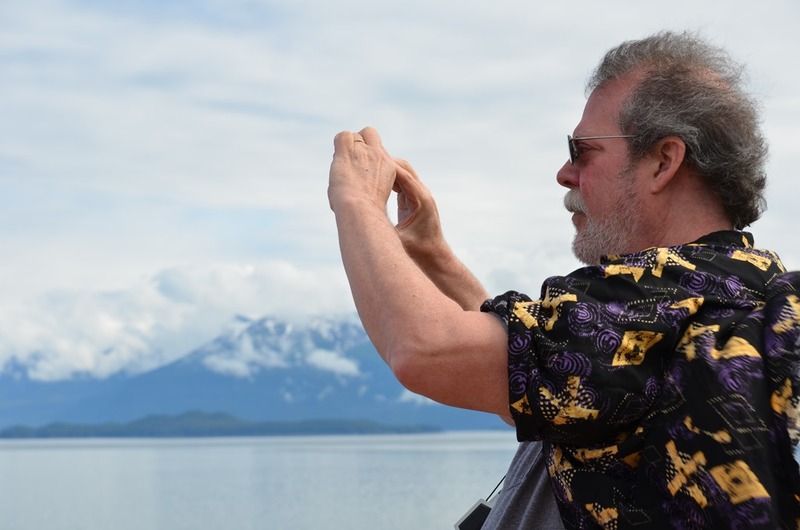 We both took lots of photos and I was very glad I had invested in the new 55-300mm lens that I bought for this cruise, after seeing on the May cruise that my 18-200mm, while a great general purpose “walking around lens, fell just a little short for getting good wildlife shots. Tom stuck with his phone cam, but he still got some great pictures. I did take some time out to meet with our very small Facebook group again while Tom went to the gym to work out. We had set up two meetings because some people had conflicts with the sea day. Once again, though, only the same couple showed up, and once again, that was fine and we had a great visit. 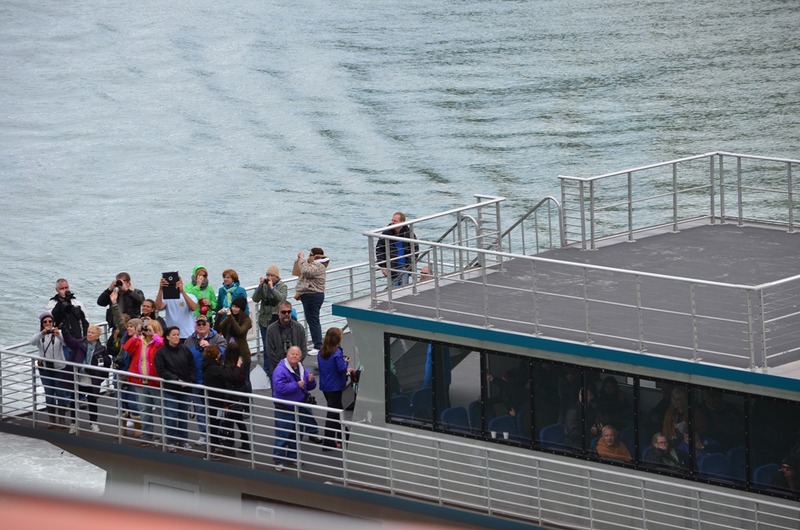 Afterward, I went back to the cabin and found Tom, and we went up on the top deck to see the sights from a different perspective. It’s always fascinating to see how different the ocean water is in different places. It can go from light blue/grey to deep blue to turquoise, from flat and glassy to choppy in the course of minutes. 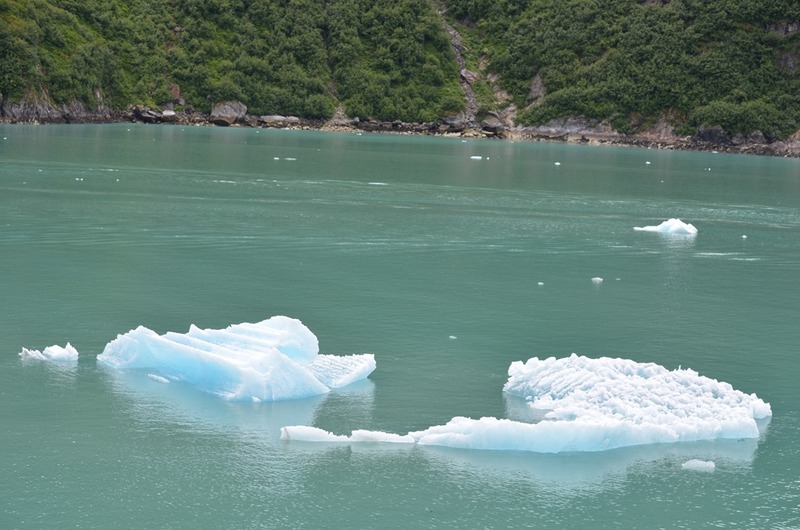 We saw a lot blue ice, floating in the fjord. Blue ice is formed when snow falls on a glacier and is compressed and becomes part of the glacier. 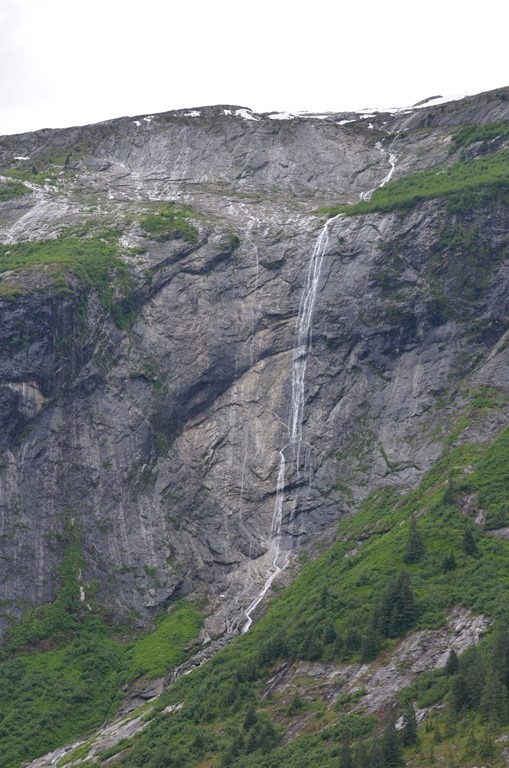 We also saw dozens of beautiful waterfalls, some frozen and some not. 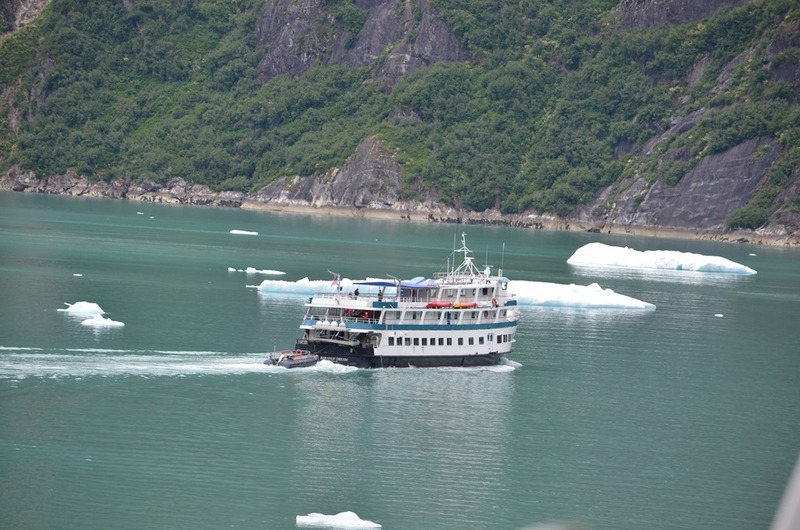 For those who wanted to get a much closer look at the glaciers, there was a small boat excursion. We wished we had signed up for it, and plan to do it next time we go. 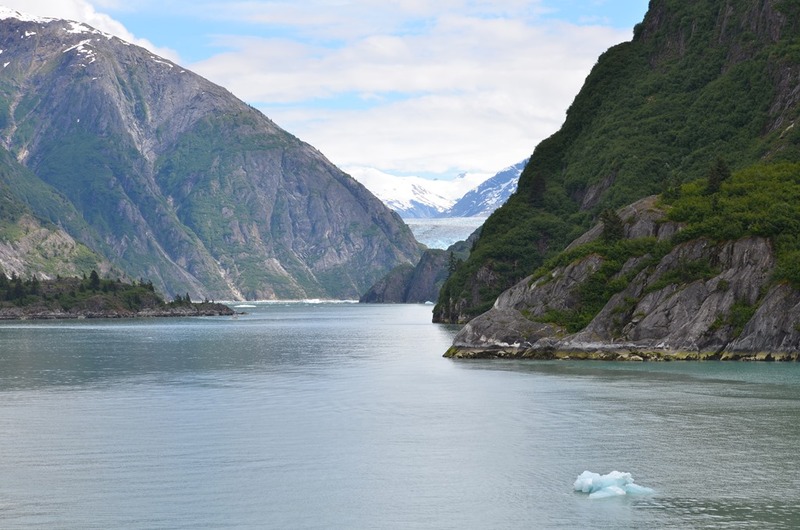 As we neared the end of the fjord, we did get a glimpse of the glacier in its majesty – but that was nothing compared to the look at glaciers that we would get a couple of days later. 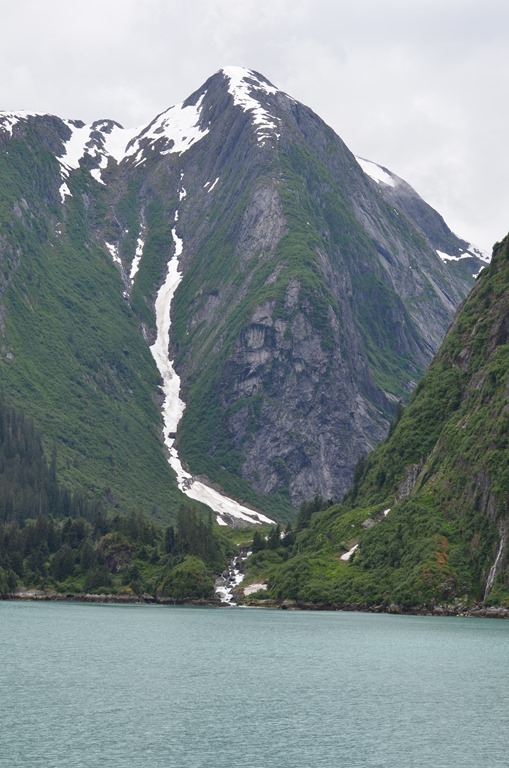 Tracy Arm was gorgeous and we had a great day sailing through it. 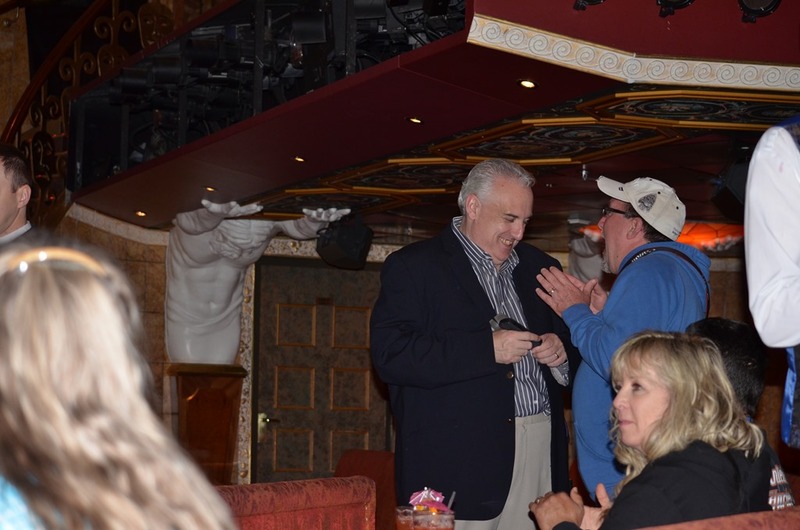 The past guest party was that evening, and that was a different kind of great, as John welcome us all back, told funny stories, honored those with the most cruises, and everyone drank free drinks, ate free appetizers, sang and danced to the tunes of the Miracles, the live orchestra that really made the shows special. Another day was over, much too quickly. 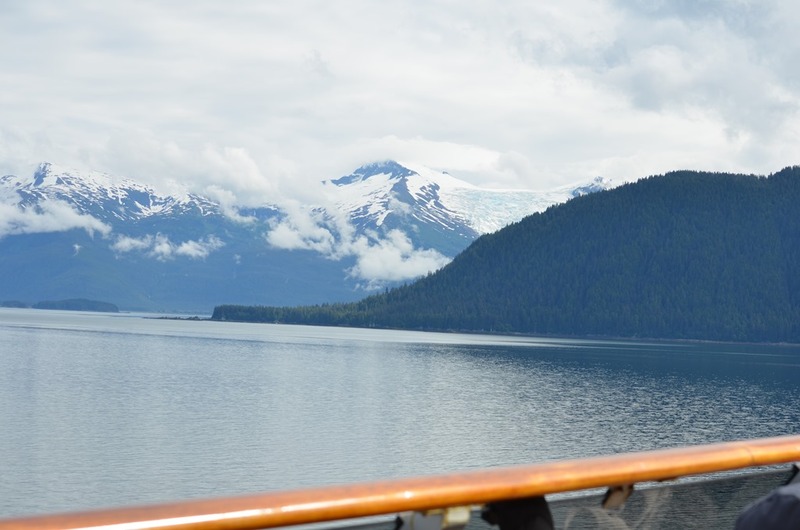 As the sun started to go down (after 10:00 p.m.), Tom sat on the balcony, reading, and I relaxed in the cabin, psyching myself up for the next day and our first port of call – Skagway.